I am going to show you what my children made for their Grandma for Christmas. I know it's January, but that's how I roll. Come back on St. Patrick's Day to see what we did for Valentines Day. 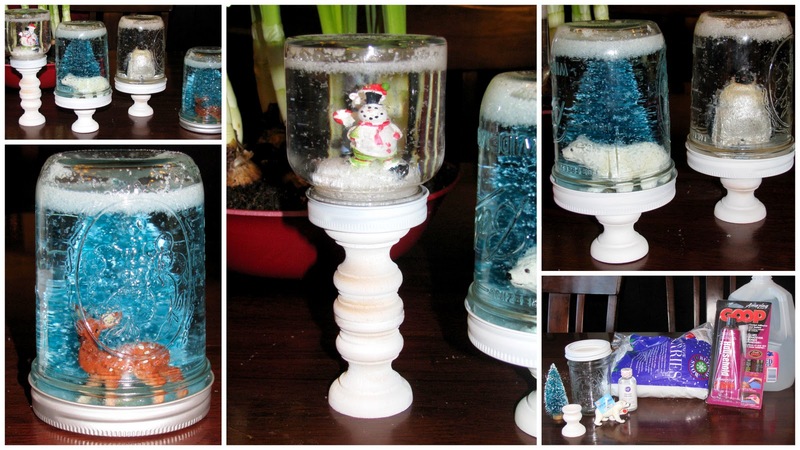 I saw these darling snowglobes around the web. Perfect for a Grandma gift! My kids had a lot of fun making these. It was a great project to do as a family. I did learn a few tips for next time. 1. A little snow goes a long way! I bought a bag of fake snow and I probably used 1 Tablespoon for each jar. 2. You can buy a can of spray paint at Walmart for only 98 cents. But prepared to spray about a gazillion coats to get a full coverage of paint! Sometimes it's worth the extra $2.00! 3. I bought glycerin to add to the distilled water. Martha Stewart claims it's supposed to make it so the snow floats slowly to the bottom. I don't think it made a difference. Don't buy the glycerin and put the $3.00 towards a higher quality of spray paint.